“I just found out a month ago, the doctor will be here before the [fight week] press conference hopefully to explain this, but I must confess that I am not human. I am an alien. No, seriously. I realize that Pluto is no longer a planet now, so I’m from Mars. I’ve definitely retired the ‘Executioner.’ You will not hear me mention the Executioner. “Now, I’m in this world but I’m not of this world. There is no aging process for me. “The breaking news is that I am an alien. “I reflect a little bit in my mind about not only defending my title, but also defending my historic career. “I’m a Philly guy. I get a lot of love in Philly, but, to be able to be a part of Brooklyn and to be fighting in a new facility that in 15 or 20 years from now, people will be talking about the great events that happened there and I will be mentioned for what I did on March 9. “When Murat’s name came up and it was agreed upon, I was like ‘let’s do this.’ I see bigger things in my future believe it or not and he’s in the way of that. “I feel like I’m in my mid to early 30’s instead of my 40’s. “If you don’t know Karo Murat, then you’ll know him after July 13. “I think you should pay attention, because I know when I was a number one contender, I was hungry for a title. “There’s a reason why a fight between Cloud and Murat didn’t happen. I got the opportunity to fight with Cloud, and here we are. “I look at it as ‘look what’s on my plate.’ The burden is on me, not Karo Murat. 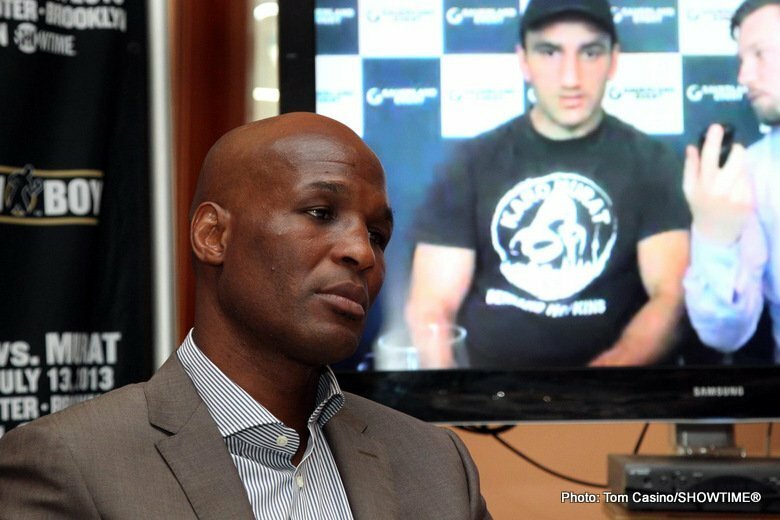 The burden is on me to be who I am and to show the world that when it comes to age, you know don’t count Bernard Hopkins out. “This guy [Murat] and anybody I fight is a danger at this stage of my career. “I have to look past him to the future. That means I’m motivated to make a profound statement and outdo the last fight. That’s one of my whole objectives is to outdo what people thought was a historic moment March 9. To me, other than the push-ups, I outdid myself in both Jean Pascal fights. This is my motivation. I want a super fight before I retire. If I want that super fight, I have to get past this. This is more of a political, do or die fight for me. I’m good under pressure. “Karo Murat, to me, is that super fight for now as far as on paper, because there’s no reason to talk about anything else if July 13 becomes a disaster for my plans. It’s counterproductive to talk about anyone else past July 13. “Karo Murat has been thirsty, he’s been waiting and he has a mentality of, ‘I’m in a win win situation because there are a lot of other people who have lost to me. So that’s not an embarrassment to him. It’s almost like a badge of honor. Can you imagine getting a black eye from someone you loved and watched growing up? This guy was 10 years old when I had a title. That’s a shiner that you don’t want to heal. “I’m in a unique situation being 48 and being a guy that you don’t want to take a risk with your fighters because I have a history of ruining a lot of young fighters’ careers. “I respect what Bernard’s achieved so far in his career, but at the end of the day, I’m traveling to America for the fight of my life. I’m prepared for a battle and I’m going to show you a real battle once we get into the ring. “Of course I’m taking Bernard seriously. Who wouldn’t? Like I said, I’ve been following his career since I was 10, so I pretty much know all of his moves; everything he does, I know already. “The deciding factor will be who is mentally stronger and I believe that’s me because I don’t have the same pressure that Bernard does, so that gives me an advantage. “I believe there’s a big Armenian community in New York, so ever since I found out that I was coming to New York, I’ve been hoping all of the Armenians will come out and support me. “I’m happy that he accepted the fight. It’s by far the biggest fight of my career. “This is the opportunity of a lifetime for Karo Murat. It’s his first time fighting in the United States. He’s fighting a living legend and a win over Bernard certainly puts him on the boxing map. “Bernard is a guy that doesn’t need much of an introduction, but I feel his accolades are worth mentioning. “He’s the oldest fighter ever to win a world title and one of the greatest moments in sports history was when Jean Pascal was slow getting off of his stool between rounds, Bernard decided to do pushups in the middle of the ring. 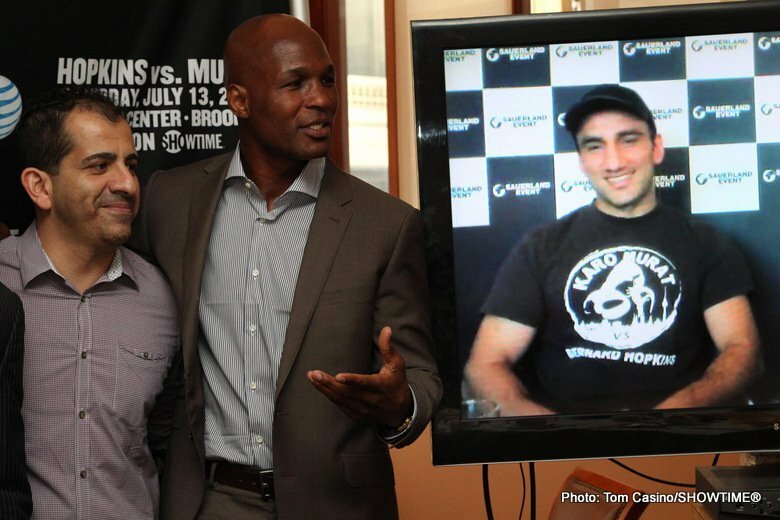 “We’re thrilled to be hosting Bernard Hopkins and Karo Murat on July 13. 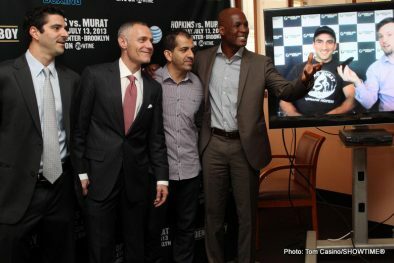 On March 9, it was so dramatic at Barclays Center when we witnessed an incredible moment when Bernard won the title. “He said to me after the fight that he wanted to make Barclays Center his home away from home, and here we go…he returns in July. “We had a vision three years ago. Our goal was to bring dramatic moments to Barclays Center. To have a big time return of boxing back to a borough like Brooklyn where there is so much history and I think it’s unfolded just the way we’ve wanted it to. “We’re building a brand and a business in Brooklyn. We’re very excited about it. “We’re thrilled that Showtime continues to deliver us to a national audience. “We’re very happy to be working with Barclays Center again. Brett and his team have been extremely creative in marketing and producing these events. Each event has had a larger crowd than the one prior, and that’s a sign of building a very solid business and building a solid venue in Brooklyn. 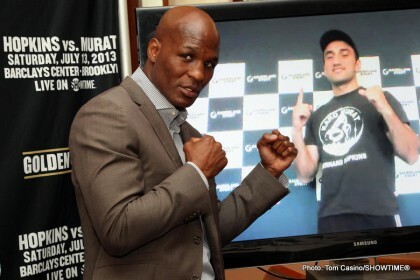 “We’re also very proud to be back in business again with Bernard Hopkins. The words ‘living legend’ get thrown around quite a bit but he literally is a living legend, a medical marvel and every time he fights it is truly an event. 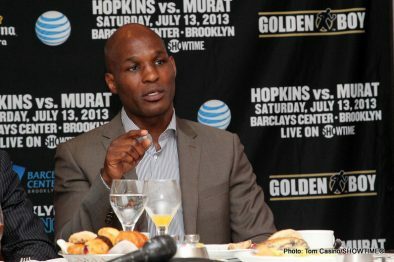 Hopkins vs. Murat, a 12-round bout for Hopkins’ IBF Light Heavyweight World Championship taking place Saturday, July 13 at Barclays Center in Brooklyn, is presented by Golden Boy Promotions, sponsored by Corona and AT&T and will be televised live on SHOWTIME CHAMPIONSHIP BOXING® beginning at 9:00 p.m. ET/PT (delayed on the West Coast). The event can also be heard in Spanish on secondary audio programming (SAP). Preliminary fights will air on SHOWTIME EXTREME® at 7:00 p.m. ET/PT (delayed on the West Coast). Tickets priced at $200, $100, $50 and $25, plus applicable taxes, fees and services charges, are on sale now and may be purchased at www.barclayscenter.com, www.ticketmaster.com, the American Express Box Office at Barclays Center, all Ticketmaster locations or by calling 800-745-3000. For group tickets, please call 800-GROUP-BK. Next boxing news: Golovkin vs. Macklin: How can Matthew win this?